I made it up to Coniston, via Kendal, with Him Indoors. The weekend weather had not looked too good. In fact we got caught in a heavy shower on the ride from Kendal to Bowness-on-Windermere. By the time we were boarding the ferry the rain had stopped, and when we arrived in Coniston the sun was shining. It continued to shine for the rest of the day. I just prayed that it would stay dry during the cyclosportive. 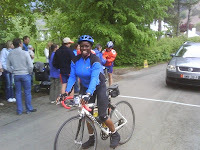 I'd felt really tense about my cycling and what shape I was in, so made up my mind that I would just aim to get round the course comfortably, and safely. As long as I set off early I would be able to complete the course at a leisurely pace, and could also hopefully avoid the rain that was forecast for later in the day. Sunday morning - race day - Him Indoors left the b&b ahead of me so that he could catch a group of his club mates to ride with. 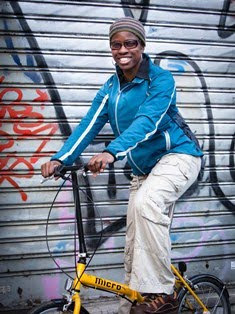 Great - so I would be on my own to ride around without feeling any pressure to keep up with the pace of any group. In all the cycling I do, I never cease to be amazed at what a small world we live in. While at the start line a man asked me if I had done a training camp in Spain - to which I replied yes. "I remember you," he said as his face lit up and he smiled. "You were on a Graham Baxters camp at Albir Garden." He was exactly right. "Gosh," I replied in amazement. "How are you ?" It was Dudley Heaton, an ex-pro road racer, who had been a cycle coach during the Baxters spring training camp back in 2000. He'd aged a little since then, but he still had the same vivacity in the way he spoke, and the Yorkshire accent. He was in Coniston helping out with the event. It was nice to see him. Ironically, when he'd seen me ride back in those days I was new to the cycling and wasn't very fast. Given the form I was in today, I wasn't going to be riding much faster ! Anyway, once I got going I felt quite happy, admiring the beautiful scenery - and the mountains. Our first climb of the day was Hawkshead Hill - just half a mile after setting off ! It was not the steepest climb by any means, but it was hard doing it on cold muscles. After that came rolling terrain until we reached another climb just after Ambleside, which was the start of Kirkstone Pass. Going down the other side gave one of the most beautiful views along the way - the sky looked wild, but the sun was poking through above the lake and between the mountains. There then followed a fast section along the A66 towards Keswick. I managed to get talking to a local lady cyclist along the way. She gave me a brief run-down of the course profile and how to get through it. Very useful stuff. After Keswick we were into Borrowdale, another very scenic area. That took us then to a trio of energy sapping climbs. 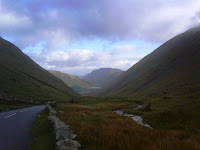 The brutal Honister Pass, Newlands Pass, and then Whinlatter Pass. There was a feed station between Honister and Newlands, and Whinlatter was not very steep. However, these climbs were long and had a few 25% ramps to negotiate. This didn't leave much time for recovery. The course continued to follow the same pattern - beautiful scenery, lakes, tough climbs over Cold Fell and Swarth Fell. Then down into Eskdale, only to see the full horror of Hardknott Pass in the distance. The sight of cars and cyclists alike struggling up the road was a truly ominous sign. I had already made up my mind that I would not be able to ride up it, so was resigned to walking up the first 33% section. Everyone else around me did the same. One guy did attempt to ride up the pass. He looked good as we shouted words of encouragement to him. Then suddenly we heard a bang. The poor guy had run out of strength and fallen over. Naturally he gave up the struggle, and we all walked up as a group. Descending the pass was no easier. My arms were aching from having squeezed the handlebars so tightly ! Imagine riding down a wall ! Wrynose was "easier", being just 25%. I fancied my chances of getting up this in the saddle. This time a few guys cheered me on while they walked up. But alas, I felt a sudden sharp pain down both of my quads, as they went into spasm. I had to dismount rapidly, and stop to stretch my legs. I didn't bother to ride again until the start of the descent. Once I'd surmounted those two beasts I knew I was home and dry. I flew down the hill back to Langdale, then did the right turn to get me back to Coniston. I was just so pleased that I'd managed the ride in such decent weather, and felt happy that I'd got round ok. It was good to see Him Indoors at the finish line waiting for me. My time of 10hrs 22 was nothing to boast about at all, but given that I felt fresh at the finish line, I know I could have ridden faster. Now that I know the course I will know how to manage my energy to get a faster time. Back at HQ we were well fed care of Wilf's cafe, and we celebrated with some local beer. And even at that early stage I was able to say "I'll be back next year." Fred Whitton is a challenge - there's no doubt about it. You need to be fit to get round all the climbs. Having said that, you don't need to be fast to get through it within the cut-off time. I am proof of that !